This time a year ago, I was in South Africa undergoing tests because of a lump I had found in my breast. A few days later my life was changed when I received a phone call from my doctor saying the biopsy had come back positive for carcinoma. I had cancer. Suddenly I was faced with having to make a lot of tough decisions about my treatment – return to the States or stay in Africa? Lumpectomy or mastectomy? Proceed with chemo despite the effects it could have on my body? I can say without a doubt that I felt the Lord guiding me in all of those decisions. I’m not going to lie….it was a crappy year and I am very thankful it is over and I hope and pray that I never have to go through it again. But having survived cancer, I have so much new revelation of God as my strength and Comforter. He so graciously surrounded me with amazing family and friends to care for me during the 7 months of my treatment. He gave me strength when I needed it. And through it all, He deepened my love and calling to the street children in Mozambique, Africa. You see, that was the hardest part….being away from my boys. Surgery was no fun, chemo was really hard and radiation was so drawn out…..But all of it was easy compared to being separated from my boys for 7 months. Thank you to all of you who stood beside me and cried with me and counseled me and prayed for me. Thank you to the wonderful doctors who provided my care. Thank you to the friends who went to chemo treatments with me and to those who so graciously invited me to out to lunch or a movie. Thank you to my mom and dad for taking such precious care of me even when I wasn’t very fun to be around. I love you all so much and am forever grateful for the family and friends God has blessed me with! Hi friends! I wanted to share a need that we have. 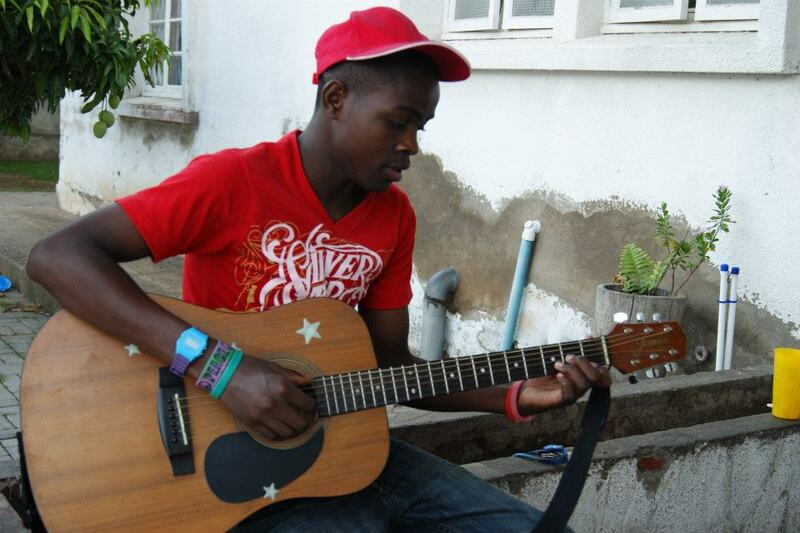 One of the boys involved in our project, Paito, has started playing guitar. He is incredibly gifted and is learning so rapidly! He has been playing for about a year and already has been invited to play with our church worship team and with a band that some friends of our have. Paito is 17 years old. He lived on the streets for a few years. In 2010, we felt that God was calling us to take him in as a son. He has now been living with us for about a year and a half. His father lives nearby so he visits him from time to time but it is not really ideal for him to live there. Upon moving in with us, Paito began playing around with the guitar. Within 2 weeks he was playing songs and soon passed the skill level of our friend who was teaching him. We've been able to talk to him a lot about how this ability is a gift from God and we're excited to see him learning more about the heart of worship. As Paito has begun playing in the worship band and this other band, he is in need of an acoustic guitar that plugs in. If any of you have one in good condition, laying around or know of someone with an extra one, it would really be a blessing to Paito as he continues to grow in his gifting. There is a team of visitors coming to Mozambique in May from Georgia and they would be able to bring the guitar over. Or if someone wants to donate funds, we could purchase one in South Africa. Please send me an email if you can help (solds19@gmail.com)!